Last Thursday was an unseasonably warm and beautiful day where we live, so we took the opportunity to test drive my plan for outdoor learning this summer. There is a little lake near our house, so the plan is to introduce Z (3 years old) to landforms, starting with the lake. My plan was for him to see the landform in real-life first, then spontaneously create the materials that he would be using repeatedly at home. I went with the expectation that an outdoor hands-on lesson would not be perfect, and that any reason to re-create the material at home with longer-lasting materials is a good excuse for lesson reinforcement. I am extremely satisfied with our first outdoor box! It was truly a last minute decision after checking the weather that morning, so the preparation was very spontaneous. 1. We started off with a 30-minute walk/cycle to the lake. It’s only about half a mile (approx. 700m) but it still took that long because we weren’t rushing. 2. Once we got to the lake, we sat down to relax and just take it all in. We talked about the lake, the geese that were swimming and making loud noises, and the birds chirping. We also talked a little about land, water and air and making the connection between what we learned at home and real life. 3. Then he started getting a bit restless and so we opened up our box. We used the brown playdough to create the land around the lake, and he poured in the blue-colored water. More discussions ensued and I placed the Lego figures next to the lake (like how we were next to the lake). Lots of “Oh yeah” comments from him. 4. Once the novelty seemed to wear off, I showed him the pre-cut construction paper and let him glue the lake onto the brown paper. 5. We finally packed up and went for a walk around the lake. I especially wanted to do this to show him that a lake is surrounded by land. While going around, he got to touch a really low weeping willow, chase a butterfly, go right to the edge of the lake, put his hand into the water/mud, and see some geese swimming, making loud noises, and dipping their heads into the water. 6. We finished off by spending some time at the playground. It really amazes me how my 3 year old can be so interested in Geography … I would never have guessed it before I learned about Montessori. We made a DIY Montessori Continent Globe, did Land/Water/Air activities, and he has already mastered the names of all the continents and now we’re working on ocean names. We also learned Western and Eastern hemispheres, and are working on Northern and Southern hemispheres now. Pretty soon, I’m going to have to start thinking hard about how I can go deeper in Geography to continue fueling Z’s passion. I’m thinking of diving deeper into each continent, but just the thought of it is daunting. 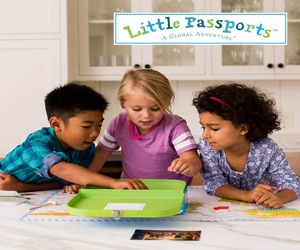 I think I’m going to try Little Passports — I’ve heard that it’s a great kit to help a child focus on a specific monthly world theme, whether it’s landmarks or music or animals. It would take so much of the prep work burden away from me. With summer here, we can even use the cute little bag to bring our learning outdoors! Are you planning some outdoor activities for your kids this summer? I’d be delighted if you would share some of your ideas with me! That is an awesome experience! I don’t know if you have heard of Trillium Montessori but she has a great Continents Package on her site. All Seven continents with various features. living/non-living, plant/animal, biomes & a-z for the major 6, parts of an animal for each and a bit more!